Is A Cheaper Vacuum (Under $100) Worth It? 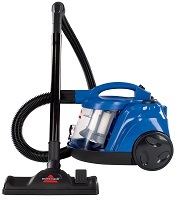 Here at bestvacuumfor.com we review all types of vacuums including upright, canister, cordless, handheld, and even steam cleaners. There are many quality brands that produce machine packed with new technology and features to help keep the modern household free from dirt and allergens. While the selection is very diverse, the price range is quite wide as well. One big question that may be weighing on your mind is ‘do I really need a vacuum that costs several hundred dollars?‘. The answer to this question is not standard for everyone and hopefully the following research will help you decide if a cheap cleaner is the best choice for your home. When looking at the higher priced vacuums you will usually see more advanced options like fully sealed HEPA filtration, various configurations and modes, adjustable suction power, and many attachments for just about any surface in your house. While these features are great they may not be necessary for your situation. This is where a less expensive vacuum might be the best choice. Why spend more than 100 dollars for technology that you just don’t need? The place to start when finding the best inexpensive vacuum is first to take note of your needs and the things you don’t need. One example is if you don’t have many carpets then you likely don’t need HEPA filters or a full sized upright. The next thing to consider is a quality company, or a brand that is known to stand behind their products. Even though you aren’t spending a lot of money you still want the machine to last you for a few years minimum. Low pricing does not have to mean low quality. Read reviews like the ones you find here as well as those from consumers to get a good feel for the specific units you are considering. Here are our top selections from the main categories of uprights, canisters, cordless, lightweight or stick vacuums. These will cost around 100 bucks or less but still have quite a bit of cleaning power for the right household. Compare the main features here and I’ll also provide a link to where you can find the lowest cost online today. The Bissell CleanView bagless upright is built with their OnePass™ technology to eliminate the need for multiple passes over the same area of your carpet. The strong suction is combined with a unique brushroll design to help pick up the dust particles the first time over. This is a big problem with the typical cheap uprights which makes them cumbersome to use, especially during those whole household cleaning sessions. The Bissell engineers built an affordable machine that doesn’t compromise on performance. Another great feature of the CleanView is the multi-cyclonic suction system, which has multiple cyclones along the airway to separate the dirt from the air before it hits the filters. This serves two purposes in that it keeps each filter cleaner for a longer time and also keeps clogging minimized. This will keep the power of the vacuum constant which results in more dirt removed on the first pass over your floors. Some of the other notable qualities include an overall light weight of around 15 lbs., a large capacity dust collection bin so you don’t have to empty as often, an extension wand for reaching high and low (with or without attachments), and a washable foam tank filter that will save you money over other brands with expensive replacement filters. It also comes with a Turbo brush tool with mini-rotating brushes for picking up pet hair and more from upholstery. This alone is a great feature for pet owners as they are constantly fighting the battle of cleaning up hair and dander from shedding animals. 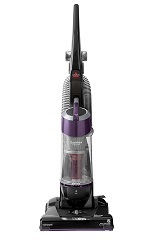 The Bissell CleanView is an excellent choice for those on a budget who are looking for a full sized upright. Click here for current pricing at our recommended online supplier. The Bissell Zing Rewind is a bagless canister vacuum with a surprising amount of cleaning performance for such a low purchase cost. It comes in a very compact frame that is lightweight and easy to move around the home. The large carrying handle also helps to take it up multiple flights of stairs, even stopping along the way to clean each stair. This is definitely what they had in mind when they designed the Zing with such a compact footprint but there are more features that provide more value. Just like the CleanView upright mentioned above, this canister has a multi-cyclonic design to separate the dust particles from the air as it spins through the pathway. With a bagless machine like this it is important to consider clogging, or more importantly how to prevent it. Bissell puts this technology in their bagless vacuums to do just that. To move from hardwood floors to carpeting, just hit a switch to turn the brush roll on or off. You can also adjust the cleaning head height for your different floors to maximize cleaning performance. The filtration is designed as a 3 stage system with dirt cup filters as well as a post motor filter. This multiple stage of filters makes sure no microscopic particles pass through back into your home. While it isn’t rated as highly as a quality HEPA system it is more than you would expect for this cheap of a price. If canister vacuum cleaners are more of what you are looking for then the Bissell Zing is our recommended option at under $100. Click here for current pricing and to read online reviews at our favorite eCommerce site. Handheld vacuums are gaining in popularity as more people realize how convenient it is to have one fully charged for those quick messes. The Black and Decker CHV1410L cordless comes with a 16 volt lithium ion battery that lasts a surprisingly long time. Lithium batteries also have the advantage of providing ‘fade free’ performance which is a big advantage over prior generations that would slowly degrade in power. The fact that the CHV1410L comes with this technology at such an affordable price is hard to believe. The translucent collection bin lets you see into the bagless container so you know when it is full. Emptying is a simple push button process, designed to keep the mess away from your skin. It too has a cyclonic suction design to prolong the life of the filter and keep the dust from clogging things up. The filter and bin are also washable as you can quickly remove the entire bowl from the vacuum’s body. All of this is designed to keep this little hand vac operating like the day you bought it. The nozzle with built-in crevice feature is slim enough to provide a good reach into those difficult spaces. The Black and Decker handheld has a brush attachment that can be flipped into place as needed. This is a nice tool to agitate pet hair or stubborn dirt from upholstery or similar surfaces so the powerful suction can do its’ job. The quick charging base is perfect to not only keep the main unit charged but to also keep your extra accessories together when not in use. It’s pretty easy to see how much value there is in this little cleaner that is among the cheapest offerings you will find today. Click here for a price check and to read online consumer reviews at our recommended supplier. The ultra popular Hoover Linx stick vac is another cordless model that comes with a ‘fade free’ lithium ion battery. We’ve already talked about the advantage of these newer generation batteries above but it is nice to see so many big name brands (like Hoover) embracing this change. With a lighter vacuum like this you won’t be doing your whole household cleaning but the Linx was designed for a different purpose. If your house has mostly hard floors and lower pile carpets then it makes an ideal choice. 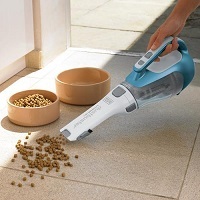 One great feature that it does have is Hoover’s Windtunnel 3 technology. This is a variation of a traditional cyclonic design with 3 distinct ‘channels’ inside that help remove the tiny dirt particles from the air. Again, this is an advantage for bagless vacuums which have traditionally been prone to clogging. The windtunnel can virtually eliminate this so the power stays strong throughout the cleaning session. The engineers combined this with a powered brushroll to allow it to clean some carpeting but it’s best to stick to thinner rugs. Other features include easy to use hand controls, bristles that reach out to the edges, a wider than you would expect cleaning path, and a convenient battery gauge that quickly shows how much juice the lithium ion pack has left. With a low profile head you can also slide it under most things you will encounter around your home. A cordless design and low weight of 10 pounds makes it very mobile, a breeze to carry from room to room. The Hoover Linx is our top rated cheap stick vacuum. Click here for current low pricing and to learn more about it.